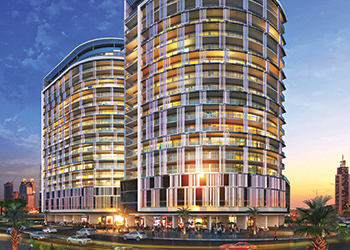 Majestine Dubai ... a key project. After having witnessed phenomenal growth, Globeclad is now ready to step into the domain of 3D printed buildings. Globeclad Fire-resistant Facades, a complete engineered solution provider for the façade industry, continues to witness phenomenal growth since it was set up formally two years ago. The UAE-based firm is poised for its next quantum leap with its services set to extend beyond facades and interior solutions to 3D printed building components. A sister concern of Alubond USA and a division of the multinational conglomerate Mulk Holdings, the company evolved from the parent firm’s contracting arm Alubond Middle East to offer the gamut of services for the facades sector, ranging from planning, design, estimation, supply of material to fabrication, project management and full-scale installation. Globeclad’s serves as a turnkey façade contractor that offers total engineering solutions for exterior applications. It has a complete facility to design and remeasure the whole composite of the external façade, says Saadullah Khan, managing director of Globeclad. The firm was primarily established to focus on fire-retardant exterior wall facades and today offers a variety of façade options comprising aluminium composite panels (ACPs), curtain-walling and glazing, engineering stone (Marestone), glass-reinforced concrete (GRC), glass-reinforced plastic (GRP) and glass-reinforced gypsum (GRG). Globeclad facades are designed to meet the new UAE Fire Code as well as all the international fire safety standards pertaining to them. “We design and fabricate or work with designs to ensure that our products are installed properly to ensure their durability. Our philosophy revolves around service beyond sales and we guarantee our products for 10 to 20 years depending on the product, design and application – hence we do not have a margin for error and are a responsible organisation committed to quality,” Khan tells Gulf Construction. To enable it to tackle some of the challenging projects that it takes on, Globeclad has a “strong connect” with two international design firms as well as a manufacturing company. Its interior solutions range from simple partitions to the most complex decorative false ceiling applications seen in banquet halls, metro stations and airports, where they are built to design sometimes with a theme or concept created by high-end architects. The company offers a full range of interior products using GRG and GRP, he adds. Alubond Solid Surface is a part of Globeclad which provides surfacing materials such as acrylic and quartz crushed stone, for the supply of workstations and other kitchen tops and bathroom vanities. “These products are to be linked to our large retail outlet for custom-made supply-and-install projects,” says Khan. He is keen to get involved on projects in the very early stages, working with consultants and architects when the soft drawings are released and when there is a possibility to change and adapt the design. Some of the key projects that Globeclad is involved with in the UAE include Majestine Hotel, Liberty Towers, and The Green Planet in Dubai, and City of Lights, Reem Island Wafra, Aloft Hotel and Abu Dhabi Airport in Abu Dhabi. Elsewhere in the region, it is working on the Lusail Sports Club in Qatar. 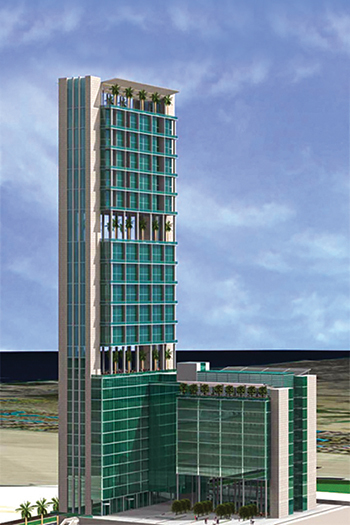 Some of the international projects which are in the completion stage include Colombo City Centre in Colombo, Sri Lanka; Top Island, Iran; and Ocean Plaza and PNSC Building, Karachi, Pakistan. Currently, Globeclad is executing prestigious cladding projects in around eight countries including in the UAE, India, Turkey, Romania and Sri Lanka. It is also presently running five major corporate identity programmes – which involve design, fabrication and installation in line with the client’s global corporate theme – one of which involves handling as many as 1,800 showrooms worldwide for a leading automobile manufacturer. It is also engaged in projects with three banks and is currently in the final stages of negotiations for some 560 branches of an international banking firm. Globeclad is now venturing into the 3D printed construction sector and has already tested and gained approval for small sample house measuring around 70 sq m which have been in the R&D (research and development) process for almost the past 18 months. Commenting on its 3D printing venture, Khan says: “It is revolutionary and futuristic. We have to now go into commercial licensing and application. We are essentially looking at doing one or two projects and then move on to take them on a larger scale. With anything that is new, we have to see what the challenges are that need to be overcome once they are installed,and when they reach the two to three-years stage,” he says. Khan envisages great demand in this sector, with the UAE aiming to have 25 per cent of its buildings 3D printed by 2030. Commenting on the new UAE Fire Code, it will ensure quality and create awareness of maintaining the highest fire safety standards. “The fire code is thoroughly researched and extremely comprehensive and more importantly, the authorities are ensuring that it is being implemented and not issuing completion certificates if any issues are not met,” he says, adding that the sector is now using A2 ACP panels even for buildings smaller than the high-rises (15 m) where their use is mandatory. Khan sees good prospects for the construction sector, particularly in the medium and long term. “There is a fundamental shift from quantity to quality and customers are more discerning of what they want and are prepared to pay for quality,” he says. While demand for conventional construction will remain steady, he sees demand for non-conventional, futuristic projects will grow at a sharper pace in response to demand and will form the core of next-generation (third and fourth generation) construction.